First person shooter has come a very long way. It was very popular in the 90s with games on various consoles and PC. 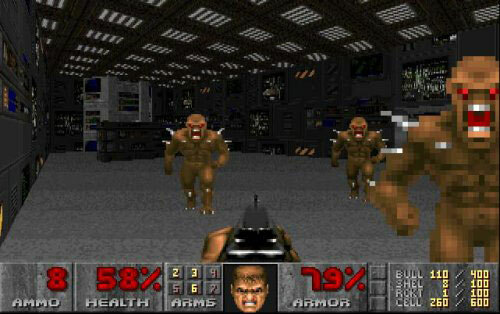 Early 90s FPS games started off with simple controls like Wolfstein and Doom. In these games the user couldn’t fully move their aimer in a 360 direction. The movement of the crosshair would only move left and right. Gamers in this time never experienced games of this nature, so they were huge hits. Then later on in the 90s games such as Medal of Honor and Goldeneye were huge hits because these games revolutionized the genre. These games were the first games that had multiplayer split screen supports for a console. The results of Goldeneye were great and had huge sales. Many gamers remember this game as the game that revolutionized console FPS games. Then in the in the early 2000s Xbox had a major hit in Halo: Combat Evolved this game changed everything because gamers never felt a game this addicting since golden eye, and it had one of the most memorable campaigns in video game history. This game showed that FPS games and video games in general can have a theatrical feel something that you can experience in a movie theatre. Then many years later Xbox launched Halo 2 which was one of the first games to effectively implement online matchmaking and one of the most memorable online multiplayer experience on a console ever. After the success of games like Halo and Halo 2 it ushered in a huge craze in console gaming. The results from the success of Halo made games like the Call Of Duty, Killzone, Battlefield, and many other FPS games have huge success when they were released. Online component of FPS games are here to stay, and many feel that every FPS game has to have online features in order for it have huge amount of sales. You say that Halo was the most addicting fps game since Goldeneye. That is an incorrect statement. You forgot Half life which many critics had regarded as the greatest fps of all time when it was released and many still give it that crown. It was also one of the most modded games and was very influential in this sort of thing. The mods Team Fortress Classic, Day of Defeat and others with Counter Strike in particular as being incredibly influential. This was much more influential on games like Battlefield 1942, Quake 3 Arena, Unreal Tournament etc than Halo was because it pioneered team based play which had not really been done before with FPS. I agree that Halo was very important for the genre, particularly for the cinematics and the story line as you addressed but Half Life was more important as a whole.